A rainbow before my flight even landed! No wonder this is my favorite island! 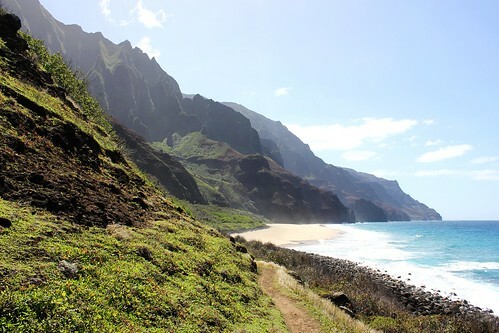 My plan was to hike the Kalalau trail – because I had fallen in love with that trail (and the beach and the valley at the end of the trail) five years ago, and have been dreaming of returning ever since. So I stopped in Hanalei for some supplies, and a meal, the day before I began the hike. 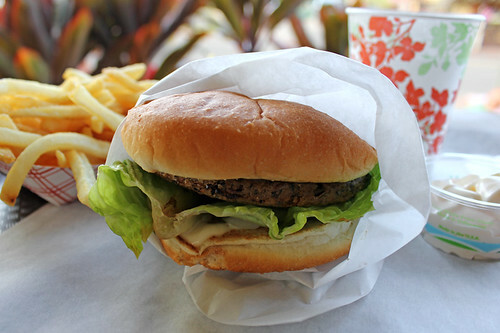 Bubba Burgers seemed like a pretty popular spot, so I investigated their menu to see what vegetarian options they might serve. Sure enough, they had a taro burger! The taro patty was vegan, but the bun was not. And it was served with toppings of lettuce, tomato, onion, and mayo - although on their regular meat burgers the menu encourages diners to forgo the lettuce and tomato and try it “Bubba’s way”. I guess they assume vegetarians cannot go without their veggies! It was pretty good, for being possibly the only real burger joint in town. The bun was nothing special, but the taro patty was tasty and fried well (although on equipment shared with meat-burgers, I should warn people who mind that sort of thing). And with the crispy lettuce and tangy mayo, it was not bad for the last “real” meal before I would spend the next several days backpacking and only eating trail food! 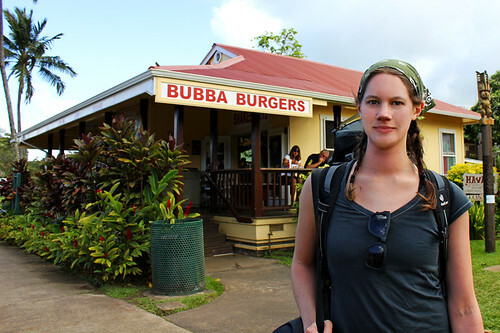 Hanalei is pretty touristy for a small town, so there are a lot of dining options, but Bubba’s was the only burger-centric spot that I noticed. The walls inside the restaurant are covered in photos of celebrities who have eaten there – like Bill Clinton and Matt Damon. 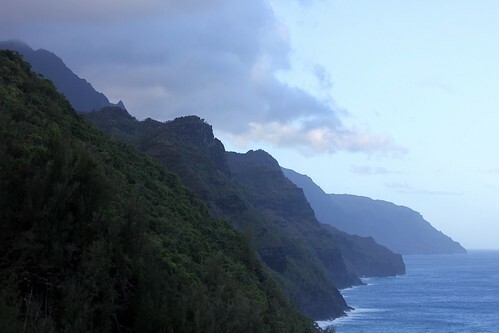 When I met back up with Joe on Oahu, he told me about a South Park episode that takes place on Kauai where, guess what! 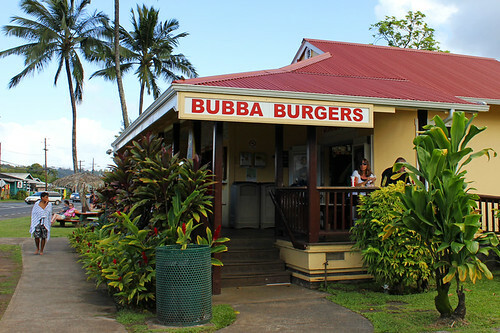 The Bubba Burger restaurant appears in cartoon form! 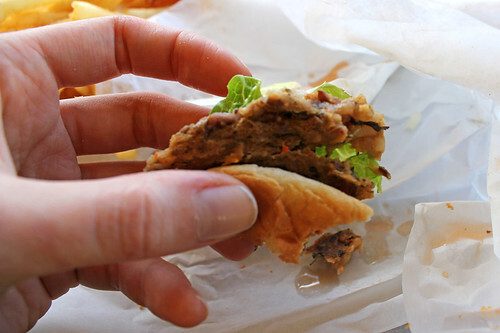 (you can watch it here) I always think it's pretty cool when such a well-known burger place includes a vegetarian option that is actually pretty good and not just an afterthought. I look pretty sunburned and sweaty, which I certainly was at that point. After I took my camera back, and thanked him, I heard his little daughter ask “why did you take her picture?” and the dad replied “She’s backpacking, so she doesn’t have anyone to take her picture”. I was so touched by that! Sometimes solo backpacking is lonely or frustrating, but then sometimes you have the most heartwarming moments with strangers you meet, like that! 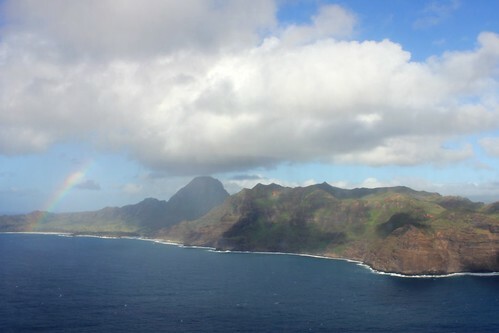 approaching Kalalau Beach - 11 miles later! I always hope to have encounters like that every day.